Image caption Pupils were moved into classrooms after the boy was seen with a "sharp craft pen"
A teenager has been arrested after a boy was seen with a sharp object in a school. 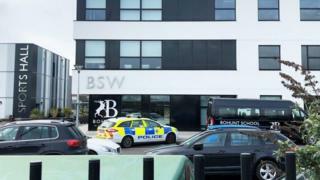 The 14-year-old was spotted with a "sharp craft pen" at about 11:05 GMT at Bohunt School in Broadwater Road, Worthing, Sussex Police said. "Pupils at the school were moved into classrooms while the incident was ongoing and no-one was hurt," a police spokesman said. The boy was arrested on suspicion of affray.